The Master of Ravenloft is having Guests for Dinner - and You are Invited! In Castle Ravenloft, you play a heroic adventurer. With magic weapons and amazing spells, you must explore the dungeons beneath the castle where you will fight monsters, overcome hazards, find treasure, and eventually face the vampire lord, Strahd! Are you ready for adventure? 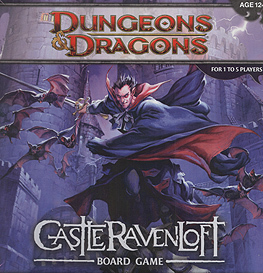 Castle Ravenloft, features dungeon-crawling action and terrifyingly fun quests designed for a single player or a cooperative group of 1-5 players. Each quest can be played in an hour or less. First of all the component count is high in this game with a lot of cardboard and miniatures. The miniatures are fantastic quality, the Blazing Skeletons will look better painted though, the cards would have benefited with some artwork but otherwise the pieces work very well. This is essentially a boardgame with Dungeons & Dragons 4e v-light rules, but this is a bonus. The game is quite quick to pick up and teach providing a lot of replayability with the supplied scenarios. The game scales incredibly well between 1-5 players and leaves you wanting to play it again and again. There is a choice of characters to play, with each character having a set of skill cards to choose from at the start, as play progresses it is possible to level up your character gaining new skills. This is a cooperative game, with the characters on an adventure with a specific goal to achieve. The heroes lose if one of their number has 0 Hit points when it comes back round to their turn and there is no healing left. The combat is streamlined and great fun with random encounters provided by cards that can produce all sorts of nasty events or very occasional something partially helpful. As the heroes defeat monsters they accumulate xp (shown on the monster cards) which can be used to level up (costing 5 XP, if you roll a Natural 20 in combat) or buy your way out of an encounter. The dungeons consists of laying out random dungeon tiles as you explore, each one producing a new monster to defeat. I found this game a lot of fun, everyone I have played it with has enjoyed it and with plenty of homegrown additions posted on boardgamegeek there is a lot going on for this game.